Neon green - so much win! When I first saw the new DR Strings Neon Hi-Def Green strings announced late last year I knew I had to try a set on my Ibanez RG550 RFR. 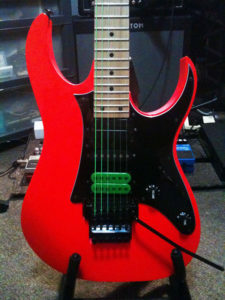 The neon green would look awesome against my neon red guitar. The neon colours are achieved by using a coating over nickel strings. DR say that the coating should last for 180 minutes of play before they start to wear and fade off. That’s not a very long time, but the impact on stage should be worth it. Some are a bit wary of coated strings. Many feel that they have a duller tone, and have a lower output than regular strings. DR say their new K3 formula has resolved this problem, and assure users that their strings will sound just as good as regular uncoated strings. Under a black light the Neon Hi-Def Green strings actually glow brightly. Under regular lights they are still extremely eye-catching too. All of this sounds great, but do they actually perform to their stated ability? On opening the package I was taken back by how bright these strings were. 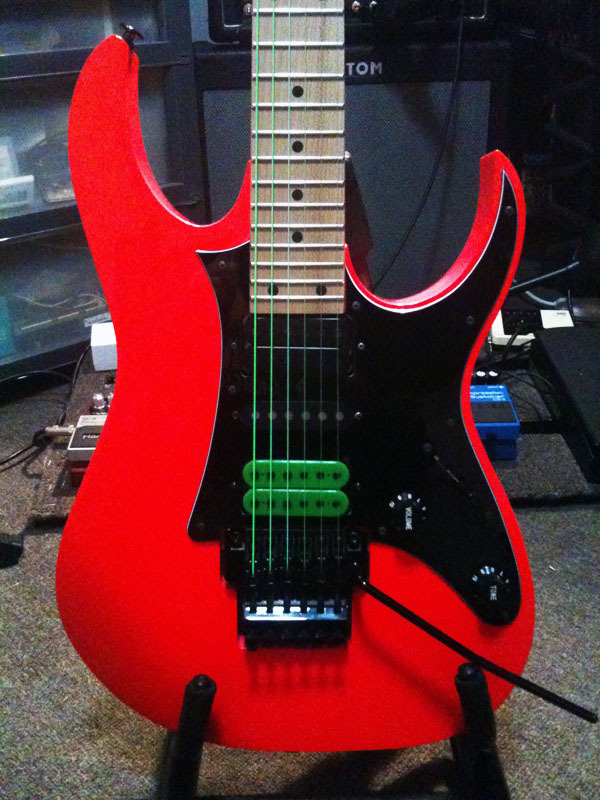 The Neon Hi-Def Green strings really pop, especially the wound strings. The green looks almost radioactive! I noticed straight away that the Neon Hi-Def Green strings felt a little different to regular strings. They almost had a cotton-like feel to them. Like the DR Tite-Fit strings I have also reviewed, the Neon Hi-Def Green strings were nice and easy to string up, and their stretch-in time was fairly quick too. Sound-wise I found the Neon Hi-Def Green strings to be bright and articulate, very similar to the DR Tite-Fits. I did notice they were a fraction duller, but nothing to really write home about. The volume was fairly comparable too. The Neon Hi-Def Green strings held up well with some string bending and whammy bar abuse. Dive bombs and high-pitched screams didn’t affect the tuning too much at all. Unfortunately two of the unwound strings started losing their coating after about 15 minutes of playing. This didn’t line up with DRs 180 minutes of colour life, so I contacted them asking about a potential fault. DR were more than happy to send out a replacement set of strings, so it is great to see that DR really stand by their product. I strung up the replacement set, and the colour on the new set has fared a little better than the first one.I did knock some of the colour off the high E string as soon as I started playing, not as bad as the first set though. I’m attributing this to the fact that I like to use fairly thick picks with sharp tips. I gave the Neon Hi-Def Green strings a good thrashing for a few weeks, and found that the tone of the strings remained fairly consistent with their initial tone, and remained in pretty good tune too. The neon green coating held up nicely on the remaining strings, with the only noticeable colour wear occurring on the non-wound strings. I’m guessing that due to the wound strings construction the coating holds on a bit better. The only place I’ve really noticed the colour coming off is where I pick. This wont really take away the impact of the strings on stage as they will be covered up by the picking hand for the most part while playing. Overall the DR Strings Neon Hi-Def Green strings are a pretty cool idea. You wouldn’t use them all the time when playing at home, or at rehearsals, but they are a fun string to use while on stage to add a bit of wow factor to your guitar. I would love to see DR perfect the colour coating formula so they last a lot longer.